It’s a bizarre moment. The temperature is hitting 37C at 11am in an old garage north of Accra. In my hand is a seriously impressive glass of Hefeweizen, the Bavarian wheat beer. It’s full of chewy banana flavours, yet crisp and light. The equipment around me is old. A mash tun and pump bought second-hand from Italy 15 years ago. The fermenter has been fashioned by welders from a photograph, under the direction of Clement Djameh, owner of Inland Microbrewery. Clement is a Ghanaian from the Volta Region who through bitter determination fought to study in Germany at Weihenstephan, TU Munich where the oldest, and most respected, brewery in the world is located. The Hefeweizen in my hand, with a rich, creamy head, was first born in the valleys of Bavaria but has been recreated in the humid hills north of Accra. But there’s something even more remarkable: it’s made entirely from sorghum, a native grain that completely replaces barley in all the brewery’s Pilsners and Hefeweizens. 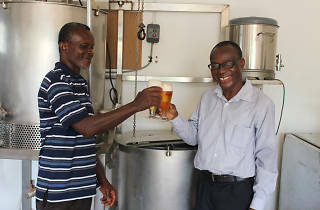 Clement, in fact, was instrumental in also helping several much larger Ghanaian breweries to replace the expensive malted barley with sorghum, an abundant crop and one that offers a steady, and much needed, supply chain to rural farmers across Accra. Clement is also experimenting with the abundant sweet potato as an adjunct to limit the need of barley or even malted sorghum. 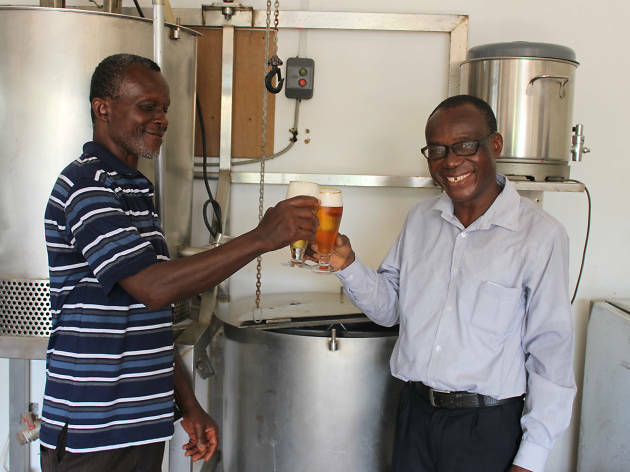 Brewmaster Clement started his microbrewery 15 years ago when he left the employment of a large commercial brewery, but the big guys wanted him to focus on further developing sorghum so it closed up. Last December, however, he sparked up the mash tun again, supplying conferences, weddings, funerals and parties with the best lager you’ll find in Accra. The brewery itself a master class in Ghanaian ingenuity.From scratch Clement has designed fermenters, kegs, bottle cleaners and even – after energy problems scuppered some brews – a full kit that can be powered by burning palm kernel husk, a much more energy-rich, cheaper and more abundant than charcoal. As the brewery stays a step ahead of the energy crisis (beer needs 24/7 energy to keep a constant temperature), Clement and his colleague Fash Sawyer, continue to supply private customers, and there are plans for expansion… we’ll be keeping a close eye on proceedings. To commission beer, contact Clement on cldjameh@yahoo.co.uk (0244 621 051).